A child's job in the first several years of life is play. Naturally, parents and loved ones want to cultivate this important skill by providing plenty of interesting play-things to kids. Toys are also how we show affection and love, especially if gifts are our number one love language. There are countless beautifully organized playrooms you'll come across online that look like enchanted wonderlands. They're filled to the brim with organized bins of toys for every age and stage and season. Thing is, in the almost seven years I've been a parent, I've grown to resent toys. I feel like a prisoner to them. First, I'll admit we're lucky to have the means to provide a good number of toys (and find them cleverly through second-hand shopping, etc.). And our kids have been the recipients of some very nice things over the years. But -- in the process -- we've amassed this huge collection. We've tried weeding. We've tried rotating. We're tried creating a sort of enchanted wonderland to encourage the critical skill of play. The kids ignore the toys most of the time. Except when they decide to throw them around. We're left cleaning them out of every corner of the house. And the kids don't help. Two of my simplification goals are to spend less time cleaning and to have my kids be more self-sufficient. So, this isn't going to work! I didn't plan it this way, but this post is going to be a three-parter. In short: We decided to get rid of most of our toys last week. And my definition of "most" or "pared down" may be different from yours. In my eyes, what we did was quite radical, and it took me several years to work up the courage to make this step. 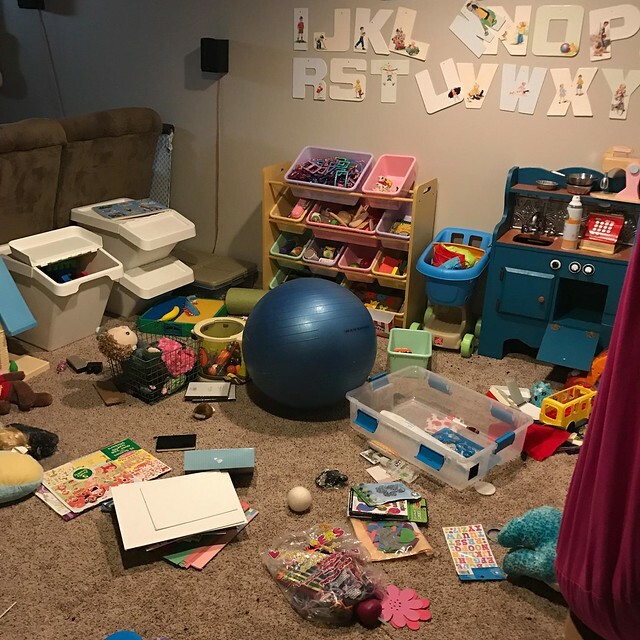 After wading through a living room of toys, cleaning them up, and realizing that much of the stuff I'd been organizing had been played with very few times, I went to the local moms buy/sell/trade group and just started listing like a crazy person. Many of the items were snatched up within 10 minutes. A couple Sesame Street figures, puzzles, etc. And I think that's mostly it. No, it isn't zero toys. It's not even just five toys or whatever minimalist goals I've run across other places online. But it's SO MUCH LESS than what we had. We had two 9-cube organizers that were bursting at the seams. They're both gone now and being used in other parts of the house as dressers. We had several large storage bins full of random toys. They're empty. We had a closet in the basement with leftover toys that didn't get much play -- it's empty. What we got rid of was a lot and included several Little People play sets I had picked up second hand over the years. Many dolls that weren't getting any love. Tons of toys that were either broken or missing pieces. Lots of Barbies, Disney princess, and other character type toys that don't totally meet our interests. Gosh, there's a lot more and this process is continuing today, so I hope to share a fuller list on my next post (and edit down the keep list above), as well as how I sold or got rid of them. I've made nearly $200 in the last week, which is great. How many toys do we hope to end up with? That's hard to say. I am thinking even fewer than we're keeping now. I feel that what we've done is just the first step, but already the girls are responding well. So, yeah. This is a huge topic. I'll devote the week to it, but if I get too in-depth today . . . I'll get bogged down and never publish!